Rarely does the opportunity arise to see a wide range of work by Charles Burchfield (1893-1967), one of the most inventive artists of the twentieth century. This summer, viewers will be able to see his art in abundance in two concurrent exhibitions. 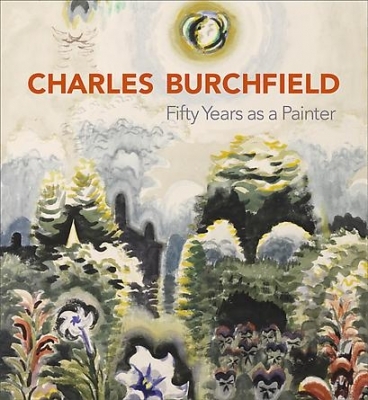 On June 10, 2010, DC Moore Gallery is opening Charles Burchfield: Fifty Years as a Painter, an exceptional group of watercolors and drawings that span his fifty-year career. Many are from private collections and have never been on exhibition before or have not been seen in public for decades. Also in June, the Whitney Museum of American Art will present a major retrospective of his work. Best known for his visionary landscapes of upstate New York and Ohio, Burchfield also addressed the harsh realities of twentieth-century industrialization and life in small towns and urban areas. Among his earliest paintings, Row of Sunflowers is a lively watercolor from the summer or early fall of 1916, when the backyards of his hometown of Salem, Ohio, were one of his principal subjects. The flowers dominate the foreground, cultivated in a lush, overgrown patch, while some of the leaves are done in unnatural color or heavily outlined in green, evidencing his increasing interest in imaginative, expressionist landscapes and the personal visual language of fantasy that became a major focus the following year. Burchfield reached a critical juncture around 1920, when he turned to a different set of modernist pictorial strategies and reduced his compositions to a severe geometry of houses and factories, barren trees, and stylized smoke undulating across the sky. After moving to Buffalo, New York, in 1921, he engaged a deeper concern with realism and became a founder of the American Scene painting movement. In the early 1940s, Burchfield returned to a more active expressionism that evolved from some of his early work of around 1917. Swirling skies, anthropomorphic forms, visual notations of insect sounds, and heavily outlined trees radiating a visible energy are some of the elements that characterize his watercolors from these years. Moon and Thunderhead (1960) presents a dramatic expanse of sky dominated by a billowing thundercloud, as stylized treetops bend in the wind below. Highlighted in yellow, turquoise, orange, and other colors that push the limits of naturalism, the shapes pile up into a central mass that signals a gathering storm. White Picket Fence (c. 1965) is a bold, large-scale work that conveys the visionary nature of Burchfield’s late watercolors. Through the use of luminous color and strong expressionistic technique, he imparted a dreamlike quality to a wild, yet familiar, landscape that is crowned by a transcendent sun glowing through a treetop, filling the sky with a diffuse spirituality. Coinciding with the Whitney Museum of American Art’s presentation of Heat Waves in a Swamp: The Paintings of Charles Burchfield, curated by the artist Robert Gober, this exhibition will provide a complementary view of the artist’s unique personal vision. A full-color catalog reproducing key texts by Charles Burchfield accompanies the exhibition.